What should you wear for a job interview at a Starbucks shop? If you're interviewing at Starbucks, you should wear an outfit that has a relaxed, business casual look. You do not need to wear a formal, professional outfit. Instead of a suit and tie, or a dress and heels, think khakis and a button-down. You should tailor your level of formality to the position for which you're applying. Starbucks has a variety of retail positions available ranging from baristas to district managers. You should tailor your attire accordingly. For example, a woman applying to be a barista might wear colored slacks and a simple blouse, but a nice skirt and a heel if she were applying to be a manager. Because Starbucks is in the food service industry, you should prioritize cleanliness and make sure you appear well-kept. For example, long hair should be tied back, nails should be trimmed, and clothes should be wrinkle-free and without any stains. It's important to look presentable, even if you're not applying for a professional office position. However, if you're aiming for a manager position, you might want to dress up a little more, perhaps adding a tie if you're a man, or wearing a pencil skirt and more formal blouse if you're a woman. Still, a full business suit is not necessary unless you're applying for a corporate job. Be familiar with the Starbucks brand, including the different types of drinks they serve. You should know what a dirty chai latte is or how to make a double caramel macchiato. Don't expect to "wing it" - and if you say you have prior barista experience, make sure you can back it up since you might be asked to provide specific examples and anecdotes from your previous work in a café. That said, if you don't have experience in a café, it's definitely better to be upfront about it. Starbucks has a thorough training program to integrate new workers into its service model. You should also familiarize yourself with health and safety standards in the food industry specific to your state since this is another topic that might come up in your interview. 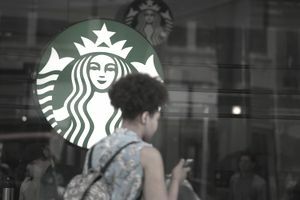 Starbucks prizes a high level of customer service, so be prepared to answer interview questions related to customer service and how you would handle a variety of situations and scenarios that could come up in a day's work. Practice customer service interview questions and answers before the interview. Match your own attributes with this list of restaurant skills, so when you're asked to describe yourself or discuss what makes you a good candidate for the job, you'll be able to mention the same type of skills that the café is looking for. Also take the time to match your qualifications with the job requirements, and be ready to share the information with the interviewer. The closer a match, the better your chances of getting hired. Review Starbucks' career page to learn more about the company's hiring process. Take a look at Starbucks' policies and standards page to get a sense of what the company expects of its workers. It will give you a good idea of how to answer different questions that might come up in the interview. Come to the interview prepared. Bring a couple of extra copies of your resume, and a list of references to share with the interviewer. It's always a good idea to review the most frequently asked job interview questions and to think about how you will respond to them. Also, have some questions ready to ask the interviewer. Bring a notepad and pen so you can jot down the name and email address of the person you meet with in case they don't have a business card to share with you. You can use it to send an interview thank you note. Know when you're available to work. The schedule may be flexible, but the interviewer will want to know about your availability and if there are certain days or hours you can't work because of school or another commitment.